Realms of the Egyptian Dead: Now Available! This little work is one of the better, more dense pieces of Egyptology I’ve come across- one of the reasons I prioritized it in the new slew of works I have planned for the rest of 2018 into, probably, as late as mid 2020. 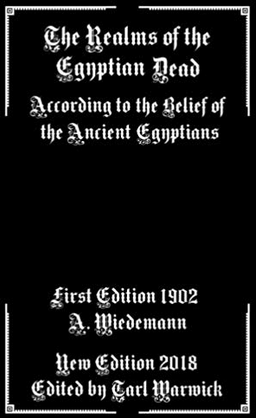 Written by Alfred Wiedemann in the golden era of Victorian academic works, it is a broad overview of a few important topics within Egyptian pagan lore- especially focusing on the transition from live sacrifice to the use of clay figurines and similar things to lend a hand to the deceased, mummified Egyptian in the afterlife, as well as the topic of the self-contradicting nature of Egyptian lore; literally that within one burial two or more mythological tales scrawled on the tomb walls may tell stories which directly refute one another, causing legendary confusion. It also contains a few bits about Egyptian mythology strictly related to Osiris and other deities, which is of decent import and quite interesting. Author styxhexenhammer666Posted on October 29, 2018 October 29, 2018 Categories UncategorizedTags alfred wiedemann, archaeology, egypt, egyptian lore, egyptian religion, egyptology, immortality, mummification, occultism, paganism, spells, victorian eraLeave a comment on Realms of the Egyptian Dead: Now Available!